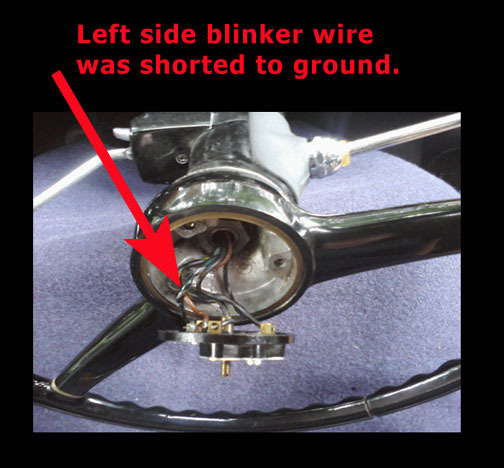 Job 54-16 "Flash Signal Mechanism"
July 25, 2012: Before taking an antique automobile out on the road, always verify the lights and blinkers are functional. Today, the left side blinkers were not working. Records indicated the same problem occurred in March 2000, and again in May 2005, but the solution was not clearly documented. So, a photo (Figure 2.) and text (see below) were sent to the International Ponton Owners Group (IPOG) for ideas on a probable cause. Figure 1. Remove the trademark cap from behind by aligning the steering wheel contact plate with the bore in the steering column jacket. Use a suitable tool (thin screw driver, or welding rod - about 20 cm long) and pop the cap out. For details, follow Job 46-2 (steps 1-4). 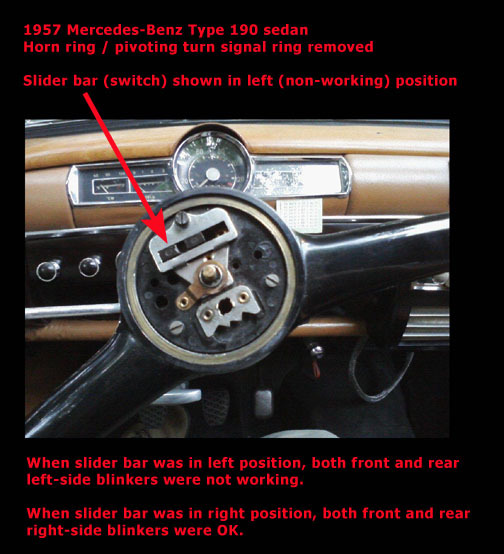 For the third time since 2000, the left-side blinkers were not working on my 1957 190 sedan. The bulbs and fuses checked OK. My notes say I purchased two blinker relays (one in 2000 and another in 2005), but both times they did not fix the problem. I don't know why I bought the second one in 2005 except that I probably forgot about the time in 2000. According to my notes, what fixed the problem in 2005 was slightly loosening the nut behind the steering wheel trademark cap (three pointed star). That did not work this time. I discovered that if the nut was too tight, the horn blew continuously. I don't know why loosening the nut fixed the blinker problem last time, but it did. There might have been some missing insulation on the ground wire, and the added stress of the nut caused it to complete the circuit. Reference Figure 2. 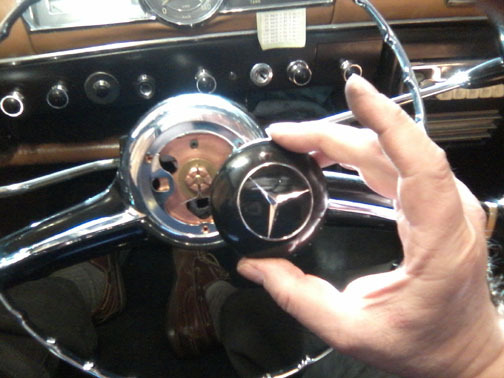 On July 25, 2012, I removed the center trademark cap on the steering wheel, and removed the chrome horn and blinker ring (early style blinker actuator ring). What you see is normally hidden behind the chrome ring and center trademark cap. 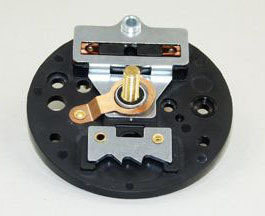 When the brown slider bar (switch actuator) was in the left position (as shown in Figure 2.) the front and rear left blinkers did not work. When the actuator was slid to the right-most position, the right-side blinkers worked fine (with the key in the "on" position). I also sprayed contact cleaner on the switch to no avail. "I'm not sure I have had this problem with the switch. Remove it with the screw above the slider at twelve o'clock and two more at 4 and 8. Then pull it out. You may have to feed the cable from below the steering box if there isn't enough slack. Then you can check the switch by jumping across the wire terminals. It will be obvious which wires go where when you look at the back side. Since you have right blinkers working, it's not the flasher unit. If it isn't the switch, you have a break in the harness. I'd suspect the wires in the column first. Check by finding the correct terminals at the junction block on the wheel arch and jumping the two relevant, the input wire to the left output. I don't remember the color code but I'm sure you have it. If that doesn't isolate it to the column, then, obviously you have a break somewhere else in the harness. I'm not sure where you look first in this case, so let's rule out switch and column first." July 27, 2012: Removed the three screws from the horn plate behind the trademark cap on the steering wheel (Figures 2 and 3.) and found 12 volts at the center blinker terminal and the horn terminal. Also found 12 volts at the right-side blinker switch terminal, but no power at the left-side terminal. The wire going to the left side terminal had some broken insulation, and must have been shorted to ground. I placed shrink-wrap around the wire and re-assembled everything. Then the blinker fuse blew (ceramic, white, 8A, position 2 from the top position of the fuse box). Once that was replaced, the blinkers were working again. May 14, 2014: Two years later – same problem again. Left blinkers not working. This time, the solution was a little different. Took the car to a repair shop (CDI). They traced the circuit, and repaired a weak connection at the wires out of the steering box. They also discovered it had been repaired before (taped up). They also taped the broken insulation on the brown "earth" (ground) wire behind the contact plate on the steering wheel. "The original drawings and original sample parts served as a template for the new creation of this vital functional part and were used as the basis for manufacturing a completely new tool kit. The new production was manufactured solely with original materials. The housing was thus manufactured in a high-quality bakelite version. To ensure permanent operational readiness, new, complext contact springs and silver contact rivets also had to be fabricated. Every contact plate was tested before delivery on a test device constructed especially for this. The result corresponds to the high Mercedes-Benz quality standards in terms of dimensional accuracy and quality. 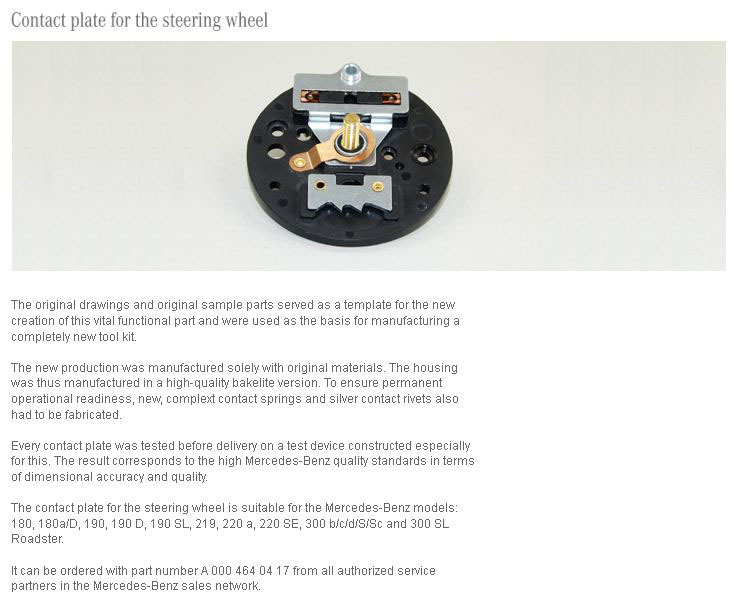 The contact plate for the steering wheel is suitable for the Mercedes-Benz models: 180, 180a/D, 190, 190 D, 190 SL, 219, 220 a, 220 SE, 300 b/c/d/S/Sc and 300 SL Roadster. It can be ordered with part number A 000 464 04 17 from all authorized service partners in the Mercedes-Benz sales network."